Now When You Shop on Amazon You can Help San Diego’s Homeless! If you already shop on Amazon, we invite you to shop at smile.amazon.com and choose Hope for the Streets (Streets of Hope San Diego official name) as your charity, and when you do a small percentage of your purchase will go to help the homeless in San Diego at no additional cost to you. Below you can read about how to do that. How Does it Work? 3 Easy Steps to Get Setup! To choose “Hope for the Streets” the screen to choose will look slightly different depending on whether or not you’re already signed into Amazon.com. If you’re already signed in, after you go to smile.amazon.com, you’ll see a screen like the one below. Simply type “Hope for the Streets Inc” (this is Streets of Hope San Diego’s official legal name) in the “Pick Your Charitable Organization” search box (see the red circle in the image below). After you enter “Hope for the Streets Inc”, proceed to step 3. If you’re not signed in, after you go to smile.amazon.com, enter your email and password to sign in (below is the sign in page). 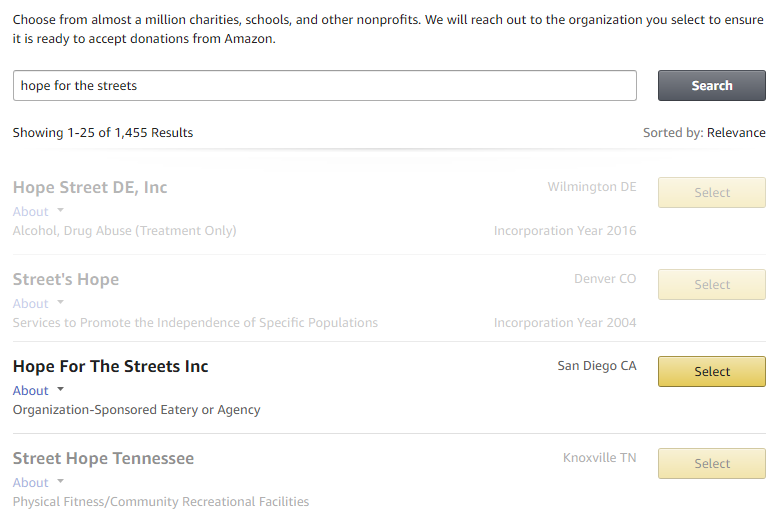 After you sign in, you will see the search box screen to search for “Hope for the Streets Inc” (Streets of Hope San Diego’s official name) as the charity of your choice. After you search for “Hope for the Streets”, you will be given a list of possible matches. Select “Hope for the Streets Inc”, as your charity choice to continue. Now Begin shopping as you Normally Would and Help San Diego’s Homeless! Once you’ve selected Hope for the Streets as your charity everything else functions the same. Shop for your favorite products or the perfect gift. Most products are eligible on Amazon Smile–if not, you’ll be notified. You can checkout normally as well. 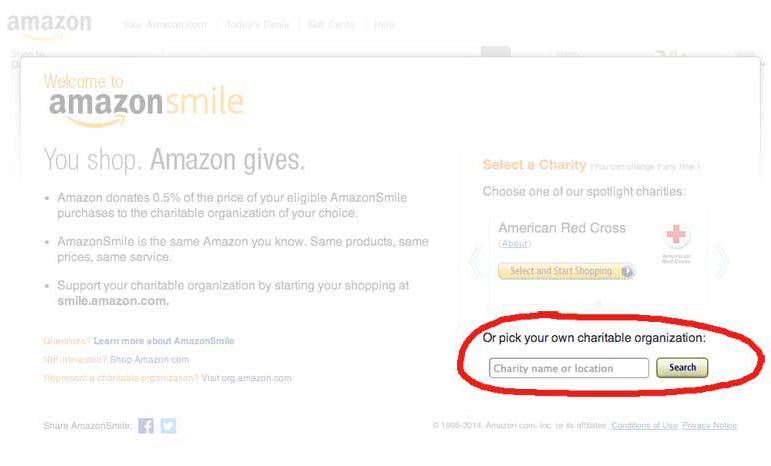 No extra cost is passed onto you–Amazon will donate 0.5% of your purchase! If You Want, Share with your friends!